Although there are many types of seagulls resident along Irish Coastlines, Herring Gulls cause the most problems. Herring Gulls are large, intelligent and adaptable birds, existing in great numbers along our coastal areas, as well as inland areas. Gulls can drink either salt or freshwater and their scavenger diets allow them great adaptability often traveling up to 30 miles to their food source. They eat anything from sea-fish to rubbish from city centres and landfills. Gulls can be a noisy and aggressive pest bird that cause regular problems in coastal cities. The build-up of large amounts of their bird droppings can result in structural damage to street lights, boats, car finishes, roof tops, etc. this is due to uric acid in their droppings. Gulls are noisy pest birds and they also gain bad reputation for their pesky behaviour around outdoor dining areas. Other problems associated with seagulls include slip and fall liability from dropping build-up, plus an unclean, dirty company image. The bacteria, fungal agents and ectoparasites found in gull droppings can carry a host of serious diseases, including histoplasmosis, encephalitis, salmonella, meningitis, toxoplasmosis and more. Gulls may also serve as a mechanical vector for a host of disease organism that are picked on their feet and feathers from their feeding areas i.e. sewage treatment plants, landfills and street rubbish. Not to mention the associated significant clean-up costs due to unresolved gull problems, as well as customer complaints from the noise and aggressive nature of the gulls. 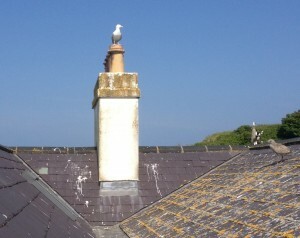 In recent years seagulls have begun the nest on rooftops in built-up areas as opposed to their more traditional nesting areas, i.e. cliffs and rock ledges. Nests on roof tops can cause significant problems as the build-up of nesting material and debris can block drains on flat roofs causing an overflow. This type of blockage can cause significant damage as it causes water to leak into buildings/attics. Nesting materials can also block ventilation areas and flues, which in turn can cause a very serious build-up of carbon monoxide inside buildings. The nesting materials can also harbour secondary insect infestations. In Ireland all gulls and their active nests are protected by National and European Wildlife Legislation/Directives. Effective control can best be achieved by proofing the immediate area where the gulls are landing or have previously nested. It is important that you contact us to check out even the smallest problems, as one or two Gulls can cause a lot of damage over a short period of time. Please also note that once birds start nesting on your roof this area in fact becomes protected, which means that the problem cannot be addressed until the birds and their chicks have vacated the nest. Wildlife Management Services have been providing effective management programmes in Residential and Commercial areas for seagulls for the last 13 years and are experts in the field. Please click on for some further information. 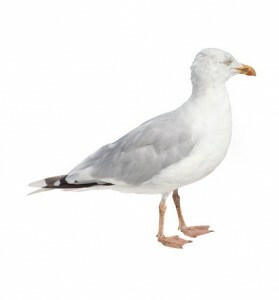 Please contact us at 087 6410206, 057 8623042 with your seagull problem.